The Book of Kells is a 1200-year-old illuminated manuscript, a book painstakingly hand-copied and illustrated by medieval monks. No one knows for sure where it was made, or how it survived numerous Viking raids. 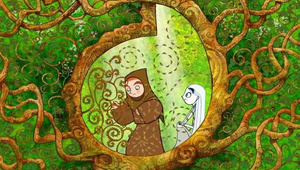 The Secret of Kells, an Oscar-nominated animated film, blends Irish history and folklore in its take on the book’s origins. Our hero is young Brendan, the nephew of the Abbot of Kells. Brother Aidan, a recent refugee from a Viking raid, befriends Brendan. Aidan has an unfinished book in his possession, but his hand isn’t as steady as it used to be, and he needs more ingredients for the colored ink. This sends Brendan outside the safety of the monastery walls, where he learns more about the world and himself. It’s in the forest where the movie really comes to life. The everyday world of the monastery with its muted color palette gives way to the deep greens of a forest that would do Hayao Miyazaki proud. The filmmakers have created a magical place that never loses its Celtic flavor.